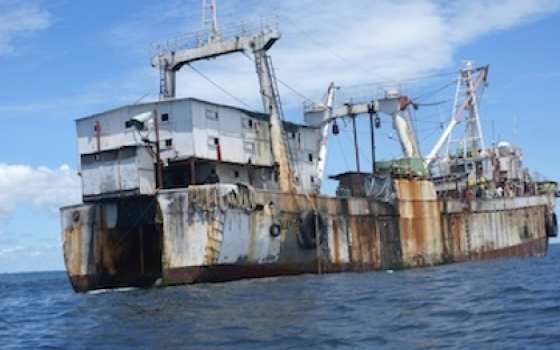 In Liberia, over 40 industrial fishing vessels have been investigated for illegal fishing since 2011. In Sierra Leone, 252 incidences of illegal fishing by ten industrial vessels were reported over an 18-month period up to July 2012. Nine out of the ten of these vessels, filmed and photogaphed by the Environmental Justice Foundation, are accredited to export their catches to Europe. West Africa supports some of the world's most productive marine and freshwater ecosystems. Up to a quarter of the region's employment is linked to the fisheries sector, and it provides essential proteins, minerals and other nutrients to the diets of millions of people. Up to two thirds of all animal protein eaten by people in coastal West African states is fish, according to the Food and Agriculture Organization. West Africa's aquatic resources are under pressure. Freshwater catches from inland lakes and rivers are being harmed by changes in land management, including deforestation, mining, and industrial farming. But the greatest impact is being felt in coastal waters. Mismanagement, weak regulatory frameworks, a lack of enforcement, too many vessels and greed have had negative consequences for fisheries. How many fish are caught each year and the health of fish stocks is not clear. Most countries do not have the capacity to accurately assess fishing in their waters, yet local people report reduced catches, and recent scientific assessments conclude that West African waters are overfished. What is clear is that limited management capacity, fast-growing populations and the demands of international seafood markets have resulted in widespread illegal, unreported and unregulated fishing, an array of practices known as IUU fishing. Illegal fishing can be defined as fishing in violation of national and international laws. Unregulated fishing happens where there are inadequate legal frameworks or there is limited capacity to conduct effective controls. Unreported fishing may be legal, but occurs where catches are not reported and recorded. In addition, marine ecosystems are damaged by destructive fishing methods ranging from the use of explosives to the widespread practice of dumping 'bycatch' -- unwanted species or sizes of fish or marine species. There are many reasons why IUU fishing occurs. In West Africa it is likely that every vessel, from the smallest canoe to the largest industrial tuna vessel, has been part of at least one aspect of IUU fishing, whether deliberately or not, at some stage of their operations. As a result, West Africa is estimated to have the highest rates of IUU fishing globally. It has been estimated that these practices cost the region $1.3 billion a year. But this figure does not reflect wider impacts on food security, social welfare, fish stocks, marine environmental health, endangered species or the potential of political unrest in coastal communities. Challenges to the proper regulation of fishing in West Africa are varied and require urgent attention. Countries are weak in logistics and expertise and have limited information on fish stocks and catches. Frequently there is a lack of clarity over which agency has jurisdiction, and when vessels are caught enforcement is often not matched by judicial penalties. Local markets generally rely on small-scale fisheries, yet up to a quarter of fish caught in this sector are lost to poor handling, transport and storage. Lucrative industrial catches are generally exported to Europe and Asia, though regional markets, particularly Nigeria, are increasingly important. These states have an important role to play in ensuring that they do not encourage IUU fishing. At the regional level there are language barriers, lack of harmonization of laws, undefined maritime borders and no formal means of sharing information. Some countries have less political will than others, which gives IUU vessels somewhere to run to. Countries with large, distant water fleets protect their vessels. Throughout West Africa, however, corruption is the biggest barrier to fisheries management, used by foreign players to get access to fish resources and to stop prosecution of illegal fishing if it is detected. Some progress is being made at the regional level. The willingness of many governments to cooperate is growing. Efforts are also being made to improve policy and legal frameworks and increase enforcement capacity. Targeted international support is growing, through funding, training and the provision of seaborne and air patrols. There is also a stronger and more focused civil society and NGO sector. In 2010, the European Union, the largest global seafood market, introduced regulations which aim to increase the traceability of catches coming from outside European waters, and allows for the 'blacklisting' of illegal fishing vessels and non-cooperative countries. While questions remain about how far the Commission and some EU member states are enforcing all aspects of the regulation, some progress has been made on identifying non-cooperative states. To date, three countries, including Guinea, have been listed as non-cooperative nations by the EU, which should result in seafood trade sanctions. A further eight countries have been given a 'yellow card', giving them six months to address identified problems. Crucially this group includes South Korea, identified for failing to control its vessels operating in West Africa, and Ghana, home of a large tuna fleet and port that heavily rely on the European market. Britain accounts for up to 60 per cent of these exports. Concerns about illegal fishing by Ghanaian-flagged vessels have resulted in several shipments of tuna being held up or refused entry to the EU market. In response, Ghana has had to address deficiencies in fisheries management and establish a dedicated ministry. There is still a need for ever stronger regional cooperation, sharing of information and improved governance. Countries should focus on securing inshore territorial waters, essential to the small-scale fishing sector and as important marine habitat. It is also crucial that West African countries ensure that crime doesn't pay. In 2013, Liberia charged two South Korean- owned fishing vessels $1 million each for illegal fishing, the highest fines ever charged by a West African state and an excellent step towards improved compliance by foreign industrial fishing fleets.